Barcelona host Roma for the 1st leg of their Champions League quarter final tie on Wednesday night. Who will win at the Camp Nou? Don't miss our Barcelona vs Roma betting preview with predictions, betting tips, lineups, team news, best odds, bookmakers promotions and no deposit free bets on this unmissable game! Barcelona are cruising toward another La Liga title this year as they currently hold a nine-point advantage over Atletico Madrid. Still unbeaten, they managed to salvage a point at Sevilla over the weekend, scoring two late goals in a 2-2 thrilling draw. The Blaugrana come into this tie on the back of a 17-match unbeaten streak in all competitions, 11 of which have ended in victory. Ernesto Valverde’s team have lost just one of their last 47 competitive fixtures – a 1-0 Copa Del Rey defeat to Espanyol in January. Furthermore, have kept 10 clean sheets in their last 12 competitive matches at the Camp Nou. The Spanish giants will be without Philippe Coutinho who is cup-tied having played in the competition for Liverpool. Sergio Busquets is a major doubt but he is expected to start in midfield alongside Ivan Rakitic. The likes of Paulinho and Andres Iniesta will play in a more offensive position behind the attacking duo Leo Messi and Luis Suarez. As alternative, Ernesto Valverde has Ousmane Dembelè at his disposal. Lucas Digne and Sergi Samper are still out through injury. Roma come into the match after a 1-1 draw at Bologna and currently sit third in the Serie A table. Anyway, the Giallorossi could be leapfrogged by Inter Milan should the Nerazzurri win the derby against AC Milan today. Eusebio Di Francesco's men are unbeaten in their last five matches and have beaten Napoli 4-2 away from home in the process. In Champions League, they have struggled on the travels this season, winning just one of their five away games. In the last 16 round, Roma suffered a 2-1 defeat at Donetsk but secured their qualification by beating Shakhtar 1-0 in the reverse match at the Stadio Olimpico. The last time these Roma and Barcelona met at the Camp Nou, back in November 2015, the Catalans hammered the Giallorossi 6-1. Cengiz Ünder and Edin Dzeko will return to the starting XI after dropping down to the bench at the weekend. Stephan El Shaarawy is likely to complete the attacking trio, with Gregoire Defrel and Patrick Schick as backup options. In midfield, Radja Nainggolan looks likely to overcome an injury he picked up last Saturday. Kevin Strootman look a sure starter in the middle of the park while Daniele De Rossi should get the nod over Lorenzo Pellegrini. We have compared odds from more than 70 best online betting sites to provide you with the highest price on on the Barcelona vs Roma match winner market (90 minutes only)! Claim your favourite odds by clicking the 'Bet' button. Don't miss the opportunity to get bigger prices! Visit our Today's enhanced offers section! This section contains our betting tips, selected by BetAndSkill professional team after a careful analysis of all the influencing factors. Feel free to copy our predictions and come back to leave a comment at the bottom of this page should you make a profit! You can also combine many or all of the recommended bets using on of our suggested Request a Bet services. Wanna get more free betting tips on today's football matches? Visit our Champions League betting tips section! 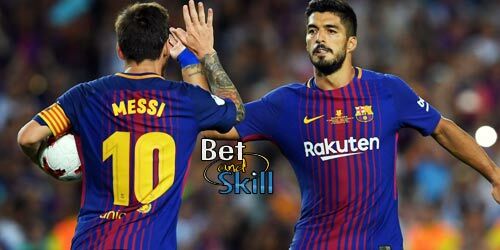 "Barcelona vs Roma betting tips, predictions, lineups and free bets (Champions League - 4.4.2018)"